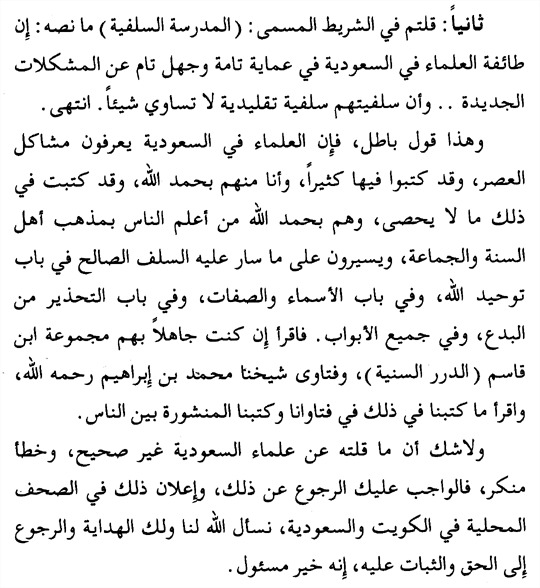 Secondly: You said in the cassette entitled, "al-Madrasah al-Salafiyyah" whose text is, "Verily, a group of the Scholars in Salafiyyah are in complete blindness (oblivion) and complete ignorance about the new problems .. and their Salafiyyah is a blind-following Salafiyyah that is worth nothing." End quote. This is a baatil (false) saying, for the Scholars of Saudi know the problems of the era and they have written a great deal about them, and I am from them by the praise of Allaah. And I have written in this regard what cannot be enumerated, and they, by Allaah's praise, are the from the most knowledgeable of people of the madhhab of Ahl al-Sunnah wal-Jamaa'ah and they traverse upon what the Righteous Salaf traversed upon in the field of the tawhid of Allaah, in the field of the Names and Attributes, and in the field of warning from innovations, and in all the (various) fields. So if you are ignorant of them, then read Majmoo'ah Ibn Qaasim (al-Durar al-Saniyyah), the Fataawaa of our Shaykh, Muhammad bin Ibraaheem (rahimahullaah), and read what we have written in our fataawaa and in our books that are widespread amongst the people. And there is no doubt that what you have said about the Scholars of Saudi is not correct, it is an error and an evil. So it is obligatory upon you to recant from that and to openly announce that in the local newspapers in Kuwait and Saudi. We ask, for us and for you, guidance and returning to the truth and firmness upon it, for indeed He is the best one who is asked. Note: Revilement of the Salafi scholars is a key feature of the methodology of these takfiris, Qutbis, Ikhwanis and this is an instrumental part of their agenda because by tearing them away from the deeply-grounded scholars (by accusing those scholars of not knowing current affairs and being ignorant), they can then lead the common masses into their innovated methodologies (which are secular in origin) and which include demonstrations, rallies, revolutions, party politics, engagement with democracy and so on. The Jam'iyyah of Ihyaa al-Turaath has amassed huged amounts of wealth through the medium of "charity work" and they have many different fronts in the form of charity organizations. These charity organizations then seek out communities, mosques and centres in various Muslim and non-Muslim lands whereby they give financial assistance and attach conditions so that the da'wah given through these institutions fits in with a particular agenda which is Ikhwani in perception and outlook. Currently, Ihyaa al-Turaath, through the cover of charity organizations is funding mosques and centres in the United Kingdom and from them is Green Lane Mosque in Birmingham.